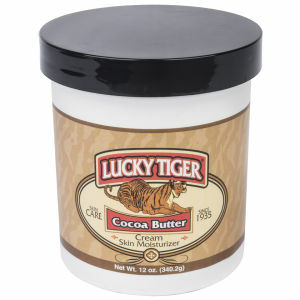 The Cocoa Butter Skin Moisturizer from Lucky Tiger will hydrate, heal and soften your skin, making it the perfect treat for dry, chapped or sun-exposed skin. Made using pure cocoa butter which can help repair the skin and banish blemishes, the moisturiser has a silky formula and a beeswax base which allows it to glide smoothly onto your skin. - L.M. Directions for Use: Apply to clean, dry skin as often as required.